Bye vs. By – What’s the Difference? Home » Bye vs. By – What’s the Difference? Homophones have confused English writers since writers began writing in English. A homophone is a word that is pronounced the same as another word but has a different spelling and a different meaning. By and bye are both common words, so it’s no surprise that they are misused often. You don’t have to be one of those people making this mistake, though—continue reading for an explanation of the differences between these confusing words. What is the Difference Between Bye and By? 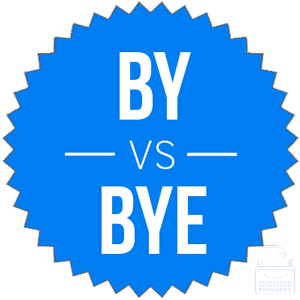 In this post, I will compare bye vs. by. I will use each of these words in at least one example sentence, so you can see how they appear in context. Plus, I will show you a helpful memory tool that will make it much easier to use bye or by correctly every time. “Say bye to your grandparents before you get in the car,” Aunt Corinne said her to children from behind a glass of chardonnay. “Bye everyone,” Mark said to his friends, knowing he might never see them again, as he boarded the space elevator to the moon. Bye can also refer to an uncontested round in a tournament, wherein a competitor may advance without having to win a match. This meaning came from lawn tennis, and is now widely used in the world of sports. The Bumblebees have a week one bye, which gives them an advantage because they have an extra week to rest their starters. What does by mean? By is an adverb and a preposition. As an adverb, by means past, as a bullet might fly past someone’s head. I saw a penny on the sidewalk, but I walked right on by without picking it up. As I drove, lights and signs flashed by out of nowhere, and I ignored them all. As a preposition, by indicates who performed an action. A form could have been completed by the human resources director, for instance, or a man could have been kicked in the face by his wife. The guitar solo on Michael Jackson’s “Beat It” was played by Eddie Van Halen. I was stopped by a police officer for speeding, but she let me off with just a warning. What does buy mean? A third homophone to bye and by is the word buy, which can function as a verb or a noun. As a verb, to buy something means to purchase it. When you get groceries to make dinner, you are buying food, and when you go to the mall to get clothes, you buy them. As a noun, buy refers to the item that one purchased. Look at these great buys I found today! Bye is a way to say farewell, or a free pass to the next round of a tournament. By is either a preposition or an adverb. By vs. Bye Check: Since bye has an E, like hockey, you will always be able to remember that bye refers to an unopposed round that a hockey team might play in a tournament. Additionally, farewell, contains an E (two of them actually), so you can remember that saying bye is saying farewell. Is it by or bye? The terms are not interchangeable, so be sure you know which is which before using either in your own writing. Bye is a shortened form of goodbye. By is a preposition and an adverb. Buy is used when talking about purchases. 1 What is the Difference Between Bye and By? Till vs. Until – What’s the Difference?